With over 20 years of experience as a BSL/English interpreter, Sarah started her career working in education at both Further and Higher Education levels. She then went on to work in the community, which amongst other areas is where she started to work in theatre. Having qualified from Durham University with a Post Graduate Advanced Diploma in BSL/English interpreting, she went on to work in a freelance capacity. Sarah’s theatre work has taken her all over the UK and she runs workshops to inspire others who have an interest in working in the theatre. Her interest in theatre has led her to develop and produce 2 visual theatre shows specifically for Deaf and Autistic young people on the topic of internet safety. They will be on tour in Spring 2017. 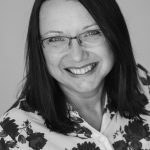 Sarah also runs her own interpreting, consultancy and training business while having 2 teenage daughters and an extremely supportive partner who also has 2 daughters. Life is busy and full of exciting challenges!